Once in a while something happens in our ordinary lives that profoundly affects us, and often it is not until after the fact that we come to know the changes that have occurred and the “tweak” to the direction in which we are going. Such an occasion just happened to me. And that was the opportunity to help with hosting a traveller from South Korea. Only a week ago I happened upon a Facebook post on a site called Sweeping Zen, which my friend Adam Tebbe is Editor of. It caught my attention right away, as this Korean Buddhist Monk was travelling by bicycle across the Americas, and would soon be arriving in my city of Winnipeg! I read the story written by Dave Pope, who had so kindly picked up the Monk on the side of the road, stranded, outside of Vernon, BC. Something about the story compelled me to send off an email and get involved. The next day I read on the Facebook page that a host had been found in Winnipeg, so I was not sure if I would be called upon to help. 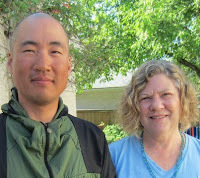 On the day after, Sunday June 3, I had a headache, and was feeling disappointed, thinking I might not be able to participate, and lose the chance to meet this Buddhist Monk, Daeung Sunim. Then I got a phone call from Robert Miyai, the person who so kindly offered his home to Sunim (Korean title for an ordained Monk). He wondered if I could help by driving Sunim to a Bicycle shop. I said I would be more than happy to help out ( I am retired and have time! ), so a time was set for Monday morning. It was a full moon that Monday, June 4, and I thought, how auspicious! Monday morning,and I was nervous! Robert had gone to work, and I was to meet Sunim on my own...what to say, how to greet a Monk? Should I take a gift I wondered...all I could think of was the fresh blueberries I had in the fridge. So off I went. Now a little background about me...I know a wee bit about South Korea, because I had the good fortune to visit there in 2001, when my son, Sky Onosson, was teaching English for a year, in a little mountain town called Youngwol. My first time out of North America and I enjoyed the trip,and the Korean people, but the only language I retained was the greeting, an-nyung-ha-se-yo.. I have long been interested in Buddhism and was able to visit some temples while I was visiting this beautiful country. So...knock on the door...wait...go to the side door...and this lovely, smiling man answered and said hello and bowed. I bowed back and mumbled my greeting and I think I surprised him. I offered the blueberries, and indicated that I would take him to a bike shop, so he placed the berries in the fridge and off we went. I had decided to take Sunim to Olympia Cycle and Ski, as it was not far, and a shop I was familiar with. I knew there was a Korean grocery and Sushi shop next to the bike shop, thinking we could get sushi for lunch. When we got out of my car, Sunim was overjoyed to see the Korean Medical Clinic, which was in-between both stores. “I go there first!” he said, and in we went. Korean greetings all around, and Sunim explained to Dr. J. Kim, about his very sore and numb hands. Dr. Kim was kind enough to treat Sunim right away. I waited and told a bit of Sunim’s story and the long journey he was undertaking, to the receptionist. After the treatment we went next door to the bike shop. As Sunim was browsing, I explained to the clerks who my friend was, and where he was going. They were so kind and when Sunim went to pay for his new bike seat and hand grips, Scott, who works there, said “no charge”. Sweet guys!!!! I suggested we then pick up some sushi for lunch, and I let Sunim order what he wanted from the Korean Sushi Chef. Then back to Robert’s house to eat. We both sat cross-legged on the lunch stools and shared our meal. I found it so easy to be with Daeung Sunim, after the morning’s greeting, I was very at ease with him. It was not hard to communicate at all, even though his English is limited. 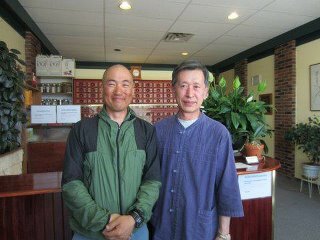 After lunch, I realized Sunim looked very tired, and I knew there was a planned dinner at the host’s house that evening, but I offered to drive him the next morning for another acupuncture treatment, and left him so he could rest. Tuesday morning, and off I go to meet the host, Robert Miyai, and pick up Sunim. Before we left the house, Sunim had his GPS out, and asked if I could also take him to MEC. The unit had the address wrong, but I knew where Mountain Equipment Co-op was located. I said, no problem! Robert suggested I try to have Sunim look at sandals there, as he only had flip-flops on, and to look for something with a firmer sole. Once again, we arrive at Dr. Kim’s. This time I asked to take some pics of Sunim receiving treatment (Adam Tebbe had suggested that would make a nice pic), and I did so. After his treatment, we headed off to downtown Winnipeg. Sunim commented that I was a good driver! So here we were in busy traffic, and we were chatting about meditation, as Robert had shared a few things with me that morning, and I was most curious. I found a parking spot, and we entered MEC. Sunim seemed to know what he was looking for, a new pack, more hand grips for the bike, and a wood-tick remover! Lots of ticks out there in the wilderness! Then to look at sandals, and when he went to pay, I was surprised that he had his own MEC membership card (perhaps acquired in Vancouver while he was there?). I suggested we get some lunch, and I made a quick detour en-route, past our Legislature, and pointed out the infamous “Golden Boy” statue on the top. Sunim made a funny face, and was not impressed! So off to Boon Burger, a vegie fast food restaurant, where we ordered vegie-burgers and sweet-potato fries with poutine, (gravy with cheese, tho the cheese was non-dairy). I am not a vegetarian but I like the fresh food at Boon Burger. Sunim enjoyed the food and the cold glass of Mango juice. He said it was his first Vegie-burger. Sunim is a very observant person, and interested in everything around him, and eager to learn better English. He commented on people with tattoos, and piercings, and said there was not so much of that in Korea. He had noted a young person on bicycle using hand signals (and not enough people do that or even know the right signals) so there I was in the car trying to show him the right ways. Rather hard to signal left through the door! I showed him again later. At one point when we spoke about the hot weather we were having, he noted that Caucasian people get leathery after years of sun, but Asian skin stays soft. Then we arrived back at Robert’s house where Sunim showed me some photos on his lap-top, pics of his wood carving hobby! Beautiful! Inspiring hobby to have! I admired his work and he told me that when he returns to Korea in a couple years he will make me one and mail it to me! I told him I will be here waiting for it!!! Then I headed home to think...or not think! “Stay in the body” says Sunim. Pay attention to what the hand does, what the foot does, where the breath is. I called Robert that evening to touch base, as I knew there was one more Acupuncture treatment, and I would drive him. Robert explained to me that a pre-paid cell phone had been purchased for Sunim, and could I help Sunim pick it up? How could I say no?! Through all this time I had been coming down with a cold, but I knew time was running out, that Sunim would be leaving Winnipeg the next day, and I would have to say goodbye to my new friend. Wednesday morning, June 6, Robert was at the house when I arrived. I showed them a book a friend had sent me awhile back, by a Korean Buddhist, Zen Master Daehaeng Sunim,“No River to Cross”. Sunim knew about the author, said it was a very good book, and we three discussed that and shared some thoughts about Buddhism. Robert gave me the papers regarding the cell phone, which was at Future Shop. So, off to the last visit with Dr. Kim, and then the Dr and the receptionist said their goodbyes in Korean, and then Sunim and I went to get the cell phone. The clerk there was very new, and it took some time, but finally got things sorted out, (Sunim noted that, in Korea, “only takes 3 minutes!”) and off we went. He wanted a bank machine to get some cash, I went to the nearest, which was CIBC, but for some reason his bank card was declined, and after several tries, we decided to get some lunch. Nearby, and en-route to the Noodle House which I was thinking of for lunch, was the only “hill” in Winnpeg, the “Garbage Hill”, which used to be the city dump, many years ago. Winnipeg is on very flat land, and this spot is one place to see the city spread out. Sunim noted all the gophers running around, and said they were “so cute, in Korea, same but not so cute!”. I took a few pics, Buddha sitting on a pile of garbage!!! And Monks do have a sense of humor, as we passed by a bicycle lying on the sidewalk, Sunim said “bicycle is sleeping!”. My last lunch with Sunim was a bit subdued, but the food was good. 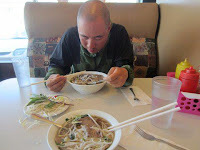 We ate Pho, or Vietnamese soup, at Mama’s Noodle House. He ordered the extra-large bowl, said he was very hungry! After, as we drove back towards Robert’s part of town, I spotted a TD ATM next to a McDonald’s, and pulled in. Sunim was so happy and overjoyed when the machine accepted his card, and he got some cash! He told me he had been very worried through lunch about what he would do if his bank card was not working. Oh the joys of modern life! I was becoming sad, knowing that I would soon have to say goodbye and suddenly wanted more time. I realized later that day, that I really wanted to sit in meditation with Sunim, but I did not know how to ask him. So I drove through a lovely old neighborhood of beautiful houses, and he enjoyed that and we discussed architecture and styles, and finally arrivied back at Robert’s place. Sunim wanted to take a pic of us, with his own camera, set up his tripod, and set the timer. Then a final bow, thank you’s, and a hug! I got in my car and felt a bit weepy! Why? My new teacher was leaving and I may never see him again! I have had some time to digest what this whirlwind visit has meant for me, and I know I have learned something very important. “What is it?” is what Sunim teaches! What is it indeed! I will tell you later! Thanks so much for sharing your experiences with everyone, Lorry!